The underlying structure of most things in the universe appears to be cube or grid like. This appears to be how the universe creates order on a primordial abstract level. The fractal cube process and the unfolding of it, is how the universe expands. The process of fractal squares provides the framework for how the golden spiral or vortex is created. The process of cube outward unfolding/expansion is a masculine process, where as the female is that of inward curved contraction. (see more here) The life code blueprint of biological beings, DNA follows the golden spiral geometry in a 3-dimensional helical like fashion. 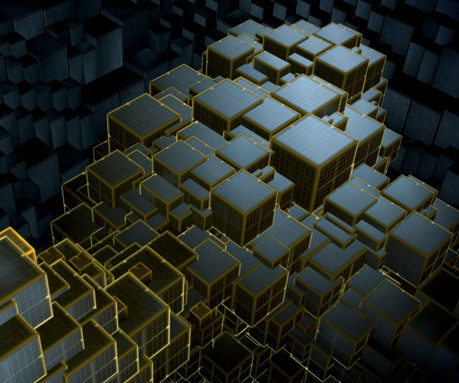 Fractal cubes are a hallmark of psychedelic trips and are often seen in incredible complexity by those taking Ayahuasca, DMT, LSD and magic mushrooms. Often they appear alive like with vitality and are in continuous motion. 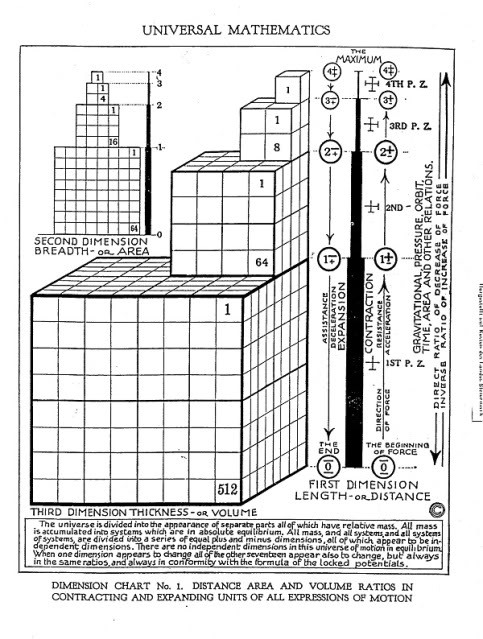 Cubes or as Seth refers to them as “consciousness units” are the smallest indivisible units of the universe. Everything is constructed from these primordial cubes which he refers to also as “mental enclosures”. Each cube signifies a unit of consciousness and is often symbolically represented as an eye signifying awareness and sentience. The cubes then stack together to form shapes much like building blocks or legos are used to construct increasingly more complex things. The cubes represent the primary substrate of the universe the stuff the material universe such as atoms and molecules are made up of. 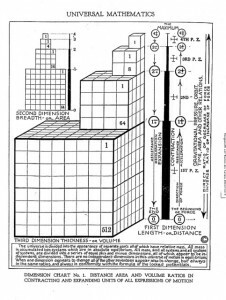 Physical reality thus is an emergent property of these cubes or consciousness units. The material universe then can be considered a secondary phenomenon. The primary gestalt exists in a hyperdimensional counterspace, where the secondary is what we perceive in “space”. 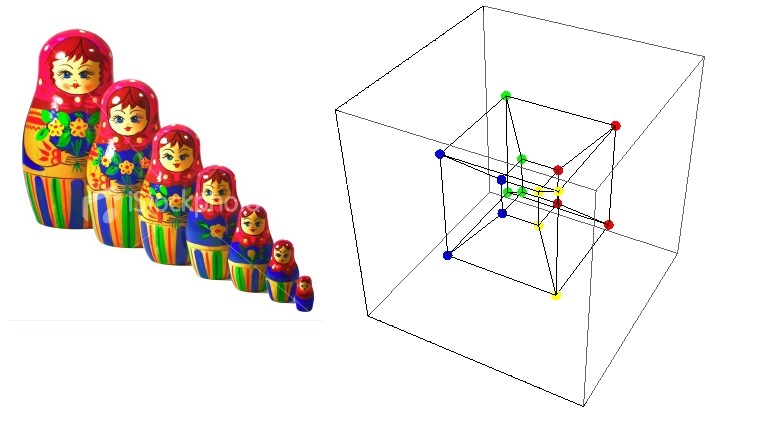 The important thing to understand is that cubes can also exist within other cubes as Russian dolls exist one within the other. The layers of onion is another good way to think about it. However, each layer then can also represent a whole other reality or level of complexity. 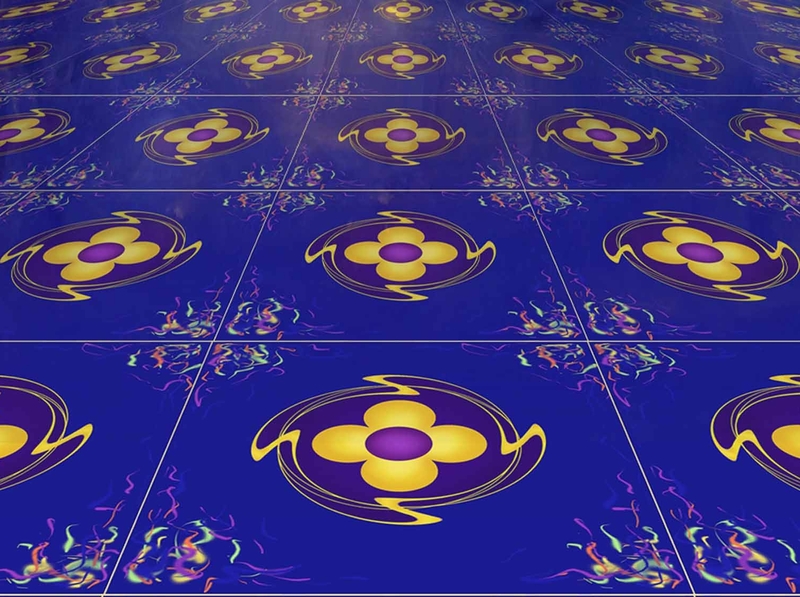 The cubes form a matrix like tapestry and greater tapestries can be considered planes. People who have gone astral travelling often report each plane or dimension looking grid like in the following way. 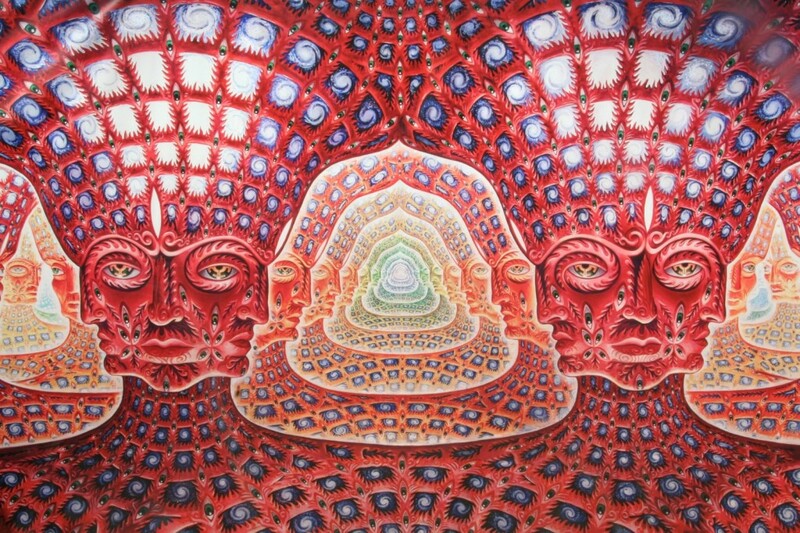 In psychdeilc visionary art such as that of Alex Grey the fractal squares represent entire universes and form the substrate or tapestry of grander shapes in a self-mirroring like fashion. This ties in with the quantum mechanics concept of infinite parallel universes. In the brain neurons are layered in a grid-like fashion with neuron pathways traversing at 90 degrees relative to one another and not diagonally as what was commonly thought. The grid matrix structure underlies the entire geometry of the universe. 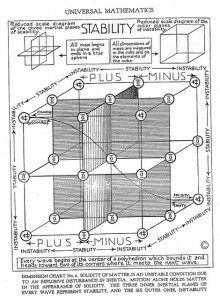 The following are excerpts from the Early Sessions of the Seth Material that expand on the concept of cubes providing the framework for fundamental reality. “As far as fifth dimension is concerned, I have said it is space. I will have to try to build up the image of structure to help you understand, but then I must rip out the structure because there is none there. 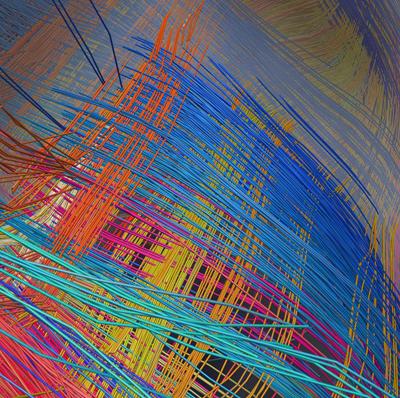 Consider then a network of wires somewhat like, although different from, Jane’s conception of idea construction – a maze of interlocking wires endlessly constructed, so that looking through them there would seem to be no beginning or end. Your plane could be likened to a small position between four very spindly and thin wires, and my plane could be likened to the small position in the neighboring wires on the other side. Yet not only are we on different sides of the same wires, but we are at the same time either above or below, according to your viewpoint, and if you consider the wires as forming cubes – this is for you, Joseph, with your love of images – then the cubes could also fit one within the other without disturbing the inhabitants of either cube one iota; and these cubes are also within cubes, which are themselves within cubes, and I am speaking now of only the small particle of space taken up by your plane and mine. Again now think merely in terms of your plane, bounded by its small spindly set of wires, and my plane on the other side. These as I have said have also boundless solidarity and depth, yet in usual circumstances to one side the other is transparent. You cannot see through, but the two planes move through each other constantly. “If you will perhaps consider again our wires and mazes, I have said if you’ll excuse the brief reminder, that these imaginary wires are composed of solidified vitality. They are the living stuff of the universe even as they form its boundaries and seem to divide it into labyrinthian ways, like the inside of a honeycomb. This is quite an undertaking in itself. The other numberless existence quadrants…, …will not concern you for quite some time. Needless to say I wanted you to know that there is much more than even this, complexities that are truly astounding, intelligences that operate in what I suppose you would call a gestalt fashion, building blocks of vitalities of truly unbelievable maturity, awareness and comprehension. These are the near ultimate. The framework is so woven that each particle is dependent upon every other. The strength of one adds strength to all. The weakness of one weakens the whole. The energy of one recreates the whole. The striving of one increases the potentiality of everything that is, and this places great responsibility upon every consciousness. “You cannot have so-called objective experiments when you are surrounded by and dealing with, and intertwined with, the elements of the camouflage universe. You are, or scientists are, working within what may be described as one small cube within literally millions of somewhat similar though different cubes, the cubes aII representing various camouflage universes. If they were ever lucky enough to pierce through their own cube, which is doubtful, they would merely discover the cube nearest to them, without ever Imagining that there were literally numberless such cubes. A small portion of the spacious present appears in your cube but you see it in camouflage terms of continuity, in camouflage waves of past, present and future. “Nothing but the various stages of consciousness separates dimensions. You can conceive of a fourth-dimensional cube, for example, but you cannot conceive of a fourth-dimensional thinking process. You cannot conceive of a fourth-dimensional psychological structure. You cannot think in fourth-dimensional terms. You cannot use fourth-dimensional imagination. In each dimension, the inner self begins to handle further aspects of reality. The primary personality must therefore deal with a much larger number of perceptions while still maintaining its identity. It manipulates in a larger number of dimensions until it is able to handle many, not just one, of its own egos at any given “time” while still maintaining its own inner stability and individuality. It takes on more roles and the psychological structure becomes more complicated as the inner self becomes sure enough of itself to admit ever more stimuli while still retaining it own core. 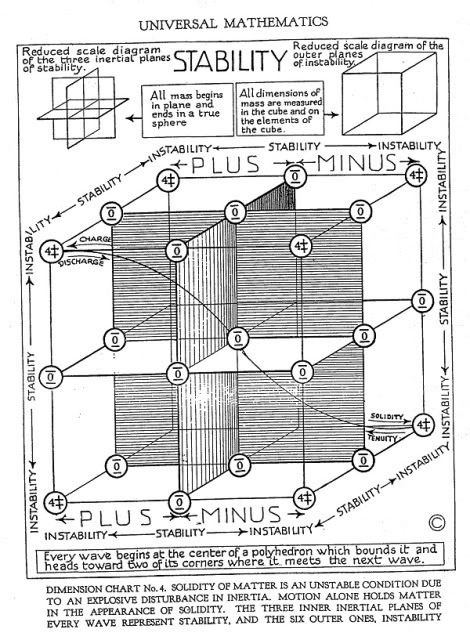 Walter Russell also had many of his own theories about how cubes are primordial shapes.